The 1992 U.S. presidential election saw Democrat Bill Clinton defeating independent candidate H. Ross Perot and the incumbent Republican, George H.W. Bush. It was one of the more lively election seasons in memory. The political atmosphere had changed considerably in the four years since the 1988 U.S. Presidential Election with an anti-incumbent "throw the rascals out" movement in full swing, and American popular culture arguably opening up space for more flamboyant liberal, even radical expressions after having been subdued during most of the conservative backlash of the 1980s. The anti-establishment, anti-hero theme was back in film (Thelma and Louise, Point Break, Pump Up the Volume, Dances With Wolves); grunge, gangsta rap, and other alternative music were suddenly very popular; environmentalism was popular with Earth Day revived as a major event; and radical groups like ACT UP and Earth First! were at their peak. Media were popularizing a new generation coming of age, tagged "Generation X" after the popularity of the Douglas Coupland novel of the same name, stereotyped as apathetic slackers. The brief euphoria surrounding the fall of the Berlin Wall and end of the Cold War had given way to a general foreign policy malaise following the first Gulf War. Public anger was brewing over incidents ranging from the federal siege of Randy Weaver's cabin at Ruby Ridge to the police beating of Rodney King, the latter leading to several nights of nationwide rioting after the police who instigated the beating were let off with a slap on the wrist. Meanwhile, on the right, Bush had alienated his conservative constituency by going back on his "read my lips, no new taxes" pledge, conspiracy theories about the New World Order were beginning to gain a following and would soon lead to the militia movement, and Pat Robertson had emerged as the de facto leader of the Religious Right following his 1988 presidential run. Most notably, the brief, controversial rise and fall of Morton Downey Jr. was followed shortly thereafter by Rush Limbaugh and conservative talk radio, which would prove to be a lasting influence. Bush's reneging on his "no new taxes" pledge and his use of the phrase "New World Order" in several speeches seem to have been the overriding motivators for former Nixon speechwriter and Reagan communications director Pat Buchanan to run a primary election challenge against Bush from the right. While not a serious threat to Bush's renomination, Buchanan's campaign galvanized the right wing, including such disparate figures ranging from Rush Limbaugh, to Murray Rothbard who had recently left the Libertarian Party in favor of trying to build a right-wing populist/paleoconservative alliance. David Duke also filed to run in the Republican primaries but was not a factor in the race. Bush was easily renominated. At the Republican convention however, Pat Buchanan along with Pat Robertson, whose Christian Coalition had become a major force at the grassroots level, were given prime time speaking slots. This backfired severely on the Republican Party when the two gave speeches declaring a culture war and denouncing everything from homosexuality and abortion, to Rodney King and his supporters, to "environmental extremists who put birds and rats and insects ahead of families and workers." After many of the rumored "heavy hitters" such as Mario Cuomo declined to run, the Democratic Party primaries attracted several second stringers: Bill Clinton, Paul Tsongas, Jerry Brown, Tom Harkin, Eugene McCarthy, Douglas Wilder, and Bob Kerrey. Dissatisfaction with those major candidates along with the anti-incumbent mood led to an unprecedented level of support for some even lesser known candidates: Irvine, California mayor Larry Agran, perennial candidate Charles Woods, and Billy Jack actor Tom Laughlin all did respectably well in some state primaries, and a write-in campaign for Ralph Nader in the New Hampshire primaries of both parties also attracted some support. Although Tsongas won the New Hampshire primary, Clinton solidified his status as the frontrunner on Super Tuesday. For the remainder of the primaries the race was between Clinton, whom the Democratic Party establishment had coalesced around, and Moonbeam, running a populist campaign as an outsider, in part on a flat tax platform. As if the anti-incumbent populist mood typified by Buchanan and Brown wasn't enough... this is where it gets really fun. H. Ross Perot, Texas billionaire, had been dropping hints of wanting to run, and on one TV show in response to a question asking him why he doesn't run, he stated he would run as an independent candidate if his supporters would get him on the ballot in all 50 states. Almost overnight, groups formed to do just that. Perot's political orientation was hard to pin down. He had a reputation as a "hawk" and his company had staged a rescue of their own workers in Iran, but he had opposed U.S. entry into the Gulf War. He came across as a conservative Texas businessman but was pro-choice and supported gun control. He was perhaps best known for his opposition to free trade agreements such as NAFTA, which he characterized as a "giant sucking sound," and for his pie charts and graphs illustrating a disaster that awaited the U.S. due to the federal debt. Perot's campaign attracted a disparate range of supporters, but arguably threw a monkey wrench into Bush's re-election chances. Then with polls showing the three running even, Perot dropped out of the race, citing his fear that his presence in the race would deny any candidate an electoral majority and throw the election to the U.S. House of Representatives. His dropping out angered his supporters so much that he re-entered the race, albeit with a much smaller standing in the polls after his reentry. Clinton selected Al Gore as his running mate, and the two used the Fleetwood Mac song "Don't Stop Thinking About Tomorrow" as their campaign theme song. 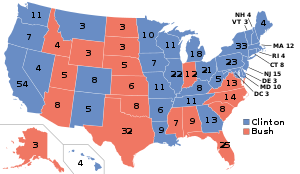 Clinton being from Arkansas and Gore from Tennessee meant both candidates were from the South, in marked contrast to the 1984 and 1988 nominees from Minnesota and Massachusetts respectively. How well this may have helped their vote could be debated. The Clinton-Gore ticket did carry several Southern states which had been otherwise trending Republican under the Republicans' Southern strategy (mostly successful for almost 20 years at that point). Initially, Bush refused to meet Clinton in a direct debate. The Clinton campaign worked to portray him as cowardly, or chicken, culminating in Bush being followed and heckled on his campaign trail by a man in a giant chicken suit carrying signs and loudly squawking: "Read my beak, Chicken George is afraid to debate!" What began as an individual initiative of two Michigan natives proved successful and soon the Clinton campaign was ensuring that the chicken would appear at each Bush event. This continued for multiple weeks until Bush made the mistake of angrily confronting the chicken in front of cameras, making national and world news. Perot won 19% of the national popular vote, but carried no states. He came in second place in Maine, which Clinton won, and Utah, which Bush won, and in third in all other states. The election turned out to be a landslide victory for Clinton, who even carried states like Georgia, Montana, and the then-still heavily Republican New Hampshire. The Bush family, meanwhile, would plot their comeback. This page was last modified on 23 July 2018, at 10:16.